The Campaign to Stop Killer Robots (SKR) is a non-profit organization comprised of groups like Human Rights Watch, Mines Action Canada, Nobel Women’s Initiative, International Committee for Robots Arm Control, among others whose sole purpose is to “preemptively ban fully autonomous weapons.” Or known another way, killer robots. The campaign was launched in the U.S .on November 2012 and in the U.K. on April 2013. According to their website, the group believes that rapid advances in technology and automation will eventually end in fully autonomous weapons systems. “These robotic weapons would be able to choose and fire on targets on their own, without any human intervention. 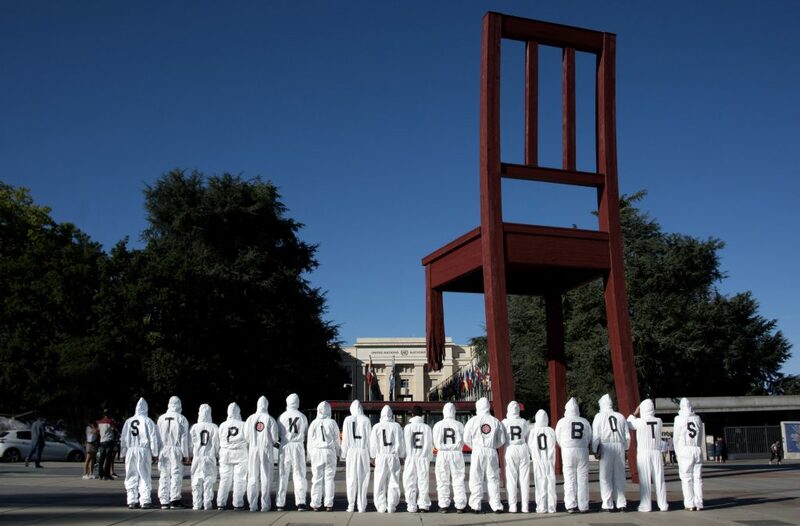 The Problem describes numerous ethical, legal, moral, policy, technical, and other concerns with fully autonomous weapons.” SKR believes a preemptive prohibition on these weapons is desperately needed, ratified in an international treaty; much like the [land] mine ban treaty approved internationally in 1997. From a certain point of view, SKR’s concern is not misplaced. Advances in unmanned aerial drone technology have become a staple of the modern battle-space with pilots often flying these machines from locations like Creech Air Force Base in Nevada, far removed from the area of operations they are piloting over. This kind of technology has revolutionized the way wars are fought, however, due to their remote operating, collateral civilian deaths in places like Pakistan, Libya, Somalia, Yemen, and Afghanistan have become a definitive consequence of the technology. The numbers of civilian deaths are expected to be in the thousands. Colombia Law, as far back as 2011, has been calling for comprehensive data from the U.S. government to be released. The National Interest reported in March of this year that Russian Defense Minister, Sergei Shoigu, announced that the country is investing in “combat robots” and that “serial production” could go into effect by the end of 2018. While this might sound far-fetched, at least 30 countries have already deployed autonomous weapons, but are currently overseen by human interaction. Not surprisingly, countries like the US, Israel, and Russia expressed a desire to explore this technology further, noting potential “advantages” and “benefits” to having autonomous weapons systems kill without human oversight. Also not lost on anyone, the irony that these three countries are the ones who almost exclusively intervene militarily, maintain occupations, and unilaterally target individuals and groups in all of the countries who voted to ban this technology. The final decision on future work of this convention will be in November of this year.